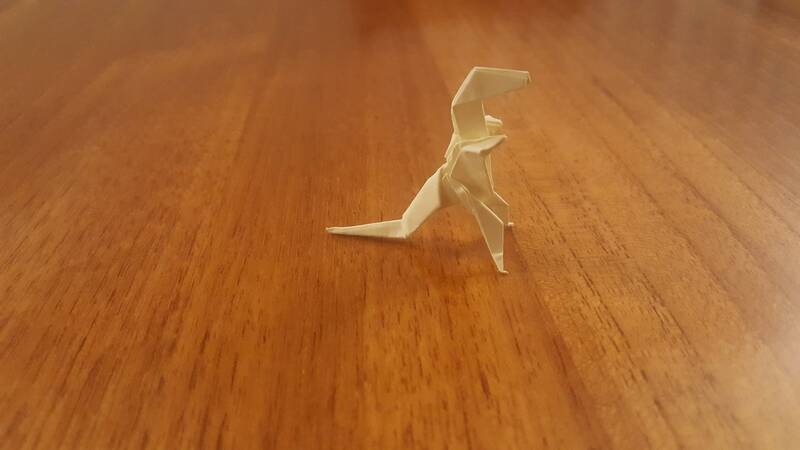 Keep in mind that this is a tiny dinosaur, so I can't really write on it. I can include a note. If you want one in a color not offered, I may have post-it pads in that color or one close to it. If I've got it, I'll make it for you. I like to create these T. Rex origami sculptures because they make me happy. I make them out of 3inx3in Post-it notes or the like. The end result is a dinosaur that is about 1.5in tall by about 1.5in long by about 1in wide. It stands up on its own, too. Since I hand-fold them myself, each one is unique. You won't find two identical ones in my store. Big ups to John Montroll.